Find-A-Grave Community Day 2014, Part 1: Fernwood Cemetery | Photo Restorations by Tim G.
The Lansdowne Find-A-Grave Meetup, gathered for Community Day. Photo by sid, annotated by sneakersox. This past Saturday, October 18th, was Find-A-Grave Community Day. I made myself useful and joined the Lansdowne meetup at Fernwood Cemetery in Yeadon. This fine historic cemetery is located just outside of West Philadelphia. Despite the best efforts of its friendly and helpful staff, 384 unfulfilled requests have been left to accumulate there. Local Find-A-Graver Jenn O. decided to do something about that, and so she organized the Lansdowne meetup using Fernwood cemetery maps that she accumulated after years of research, and burial locations culled from Ancestry.com’s Pennsylviana Church and Town records. 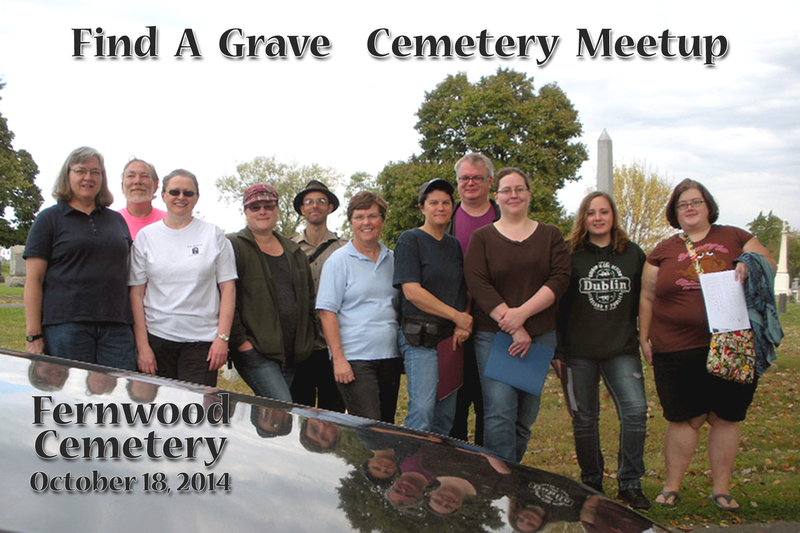 Eleven of us met at the cemetery at 10:00 for introductions, assignments, e-mail exchange, and a group photo. Two additional gravers joined us shortly thereafter. We each went off to separate sections to fulfill our assignments, and occasionally met one another out in the field and shared our successes. Most of us continued photographing until about two o’clock. Find-A-Graver CLC cameos in this photo of the Beath family monument. We didn’t plan to reconvene after the event. For next time, I’m submitting a motion to meet up afterwards for pizza and stories. Despite not having reconvened at the cemetery after the event, we have since re-connected by e-mail, and we are looking forward to future Find-A-Grave meetup events. Fernwood’s Find-A-Grave stats, as of Saturday morning were 10757 interments and 384 photo requests. It’s current stats, as of noontime, Monday, October 20, are: 11,136 interments and 298 photo requests, and that is despite 11 new requests having been entered since the start of the event. Needless to say, we put a rather large dent in Fernwood’s requests list, and substantially expanded its database. Many thanks to Jenn O. for organizing the meetup, and for my other fellow gravers for their great work! Note: I will have to return for another photo of Willaim Finley. I believe this is the wrong monument! See William Finley, d. 4/1918. Note: Find-A-Grave memorials and photos already existed for the other Weidners here. Note: This was a very large and impressive monument with a plaque honoring a fallen soldier of the Great War, indicating place of death as Vaubecourt (Meuse), France. If a monument indicates a place of death outside of the Philadelphia metropolitan area, I’ll snap it. The genealogist might be having some trouble tracking down a death certificate. This is most common with war casualties. Note: I’ll often take the time to photograph and post federally issued military headstones. In fact, I spend most of my Find-A-Grave hours at the Philadelphia National Cemetery in Germantown. I know how highly family historians regard their military ancestors. I also frequently see history projects that involve the tracing and photographing of entire infantries. I know, therefore, that military headstones are always in high demand, from family historians and military historians alike. I saw many standard-issue military headstones at Fernwood. Although I was tempted to take many additional photos of them, I restrained myself to this one. I’ll always take the extra effort to photograph a military headstone with flowers, in recognition of a loved one’s effort to visit and maintain the soldier’s grave. Plus, they always make for colorful Find-A-Grave photos. Note: I’ll always stop to photograph gravestones that indicate a foreign city or county of nativity. This information is usually unavailable on death certificates, and often missing or illegible on immigration documents. This is a military monument—and quite an interesting one at that.The four Beaths shown here were originally buried at Philadelphia Cemetery on Passyunk Ave. That cemetery went defunct in 1915, and the bodies removed to other cemeteries. Beath family researchers will be pleased to learn that this monument exists and is in fine condition. 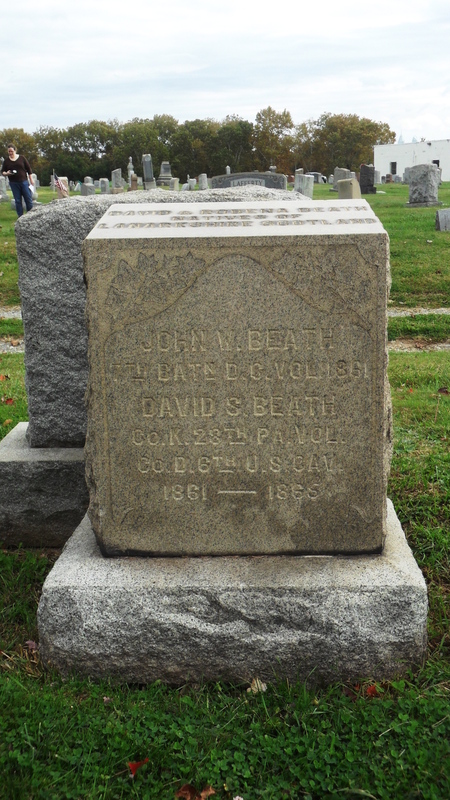 The elder David Beath’s death in 1860 pre-dated the Fernwood cemetery for over a decade. I reckon that makes his a contender for the oldest marked death and burial at Fernwood. Note: These two ladies photo-bombed my picture of John Bertron‘s monument. Why not make memorials? Note: I’ll always stop to photograph ‘endangered stones’ that appear to be on the verge of crumbling. In this case, the raised space between the ‘L’ and the ‘A’ in Samuel’s name was literally peeling of, and ready to fall to the ground with the next gust of wind or rain. Before long, Samuel’s name will be completely illegible. Fortunately, there’s Find-A-Grave. Note: It doesn’t take much to impress me. In fact, sometimes the less there is, the more impressed I am. Here is a hand-made and hand-painted wooden cross, marking the grave of one Henry S. Alexander, d. 1889. When I found the cross, it was broken and lying on the ground. I propped it up, and it stood long enough for me to snap these photos before the wind blew it over again. Congratulations, Mr. Alexander. Someone cares about you, so now you have a Find-A-Grave memorial. Note: One of my assignments was a request for an Amanda Hoffman at Section 47, Lot 367. I did not find a monument there, but I found this monument at nearby Lot 377. Perhaps it is of interest to the requester? Also note that, with few exceptions, I generally do not create memorials for graves that have been around for fewer than thirty years. Ms. Bertha Hess, here will have to wait. If any of you readers out there want to make the memorial and re-post the photo, be my guest. Note: This is an infant’s grave. She died a month shy of her first birthday, and I was quite impressed with the artistry of the monument. The bird still appears lifelike after 107 years. I have a couple young neices and nephews. I love them to tears, so I think about that when I observe the high mortality rate of censuses in times past. These young deceased children often go unnoticed in the documents because they often do not survive long enough to be counted in a census. In that case, I like to do my part to make these youngsters more historically visible. Not only that, but from a documentary point of view, once these children are found, their documents often provide ‘missing link’ information that can break brick walls. Though they are on this earth for only a short while, their importance can not be overlooked. Note: This is my paternal grandmother’s great grandfather. Her name was Harrison before she married into the Graham family. William was a Civil War veteran, and quite a family history character, being of mysterious origins, and having changed his name from William Harrison Pickergill to William Pickersgill Harrison shortly after the war. He is the reason I enjoy coming out to this cemetery, and the reason I was so pleased to participate in this project. I had previously believed that his grave was unmarked, but then I found an ‘H’ cornerstone on one of my recent visits. I did not get around to updating his Find-A-Grave memorial until today. He is buried here with his wife, son, three daughters, and three sons-in-law, and granddaughter. I’ll give them all memorials soon enough…. Those are all the photos I took and uploaded for Find-A-Grave Community Day. Special thanks to Jenn O. and the rest of the Lansdowne Meetup for making such a productive event. Next time: After party! 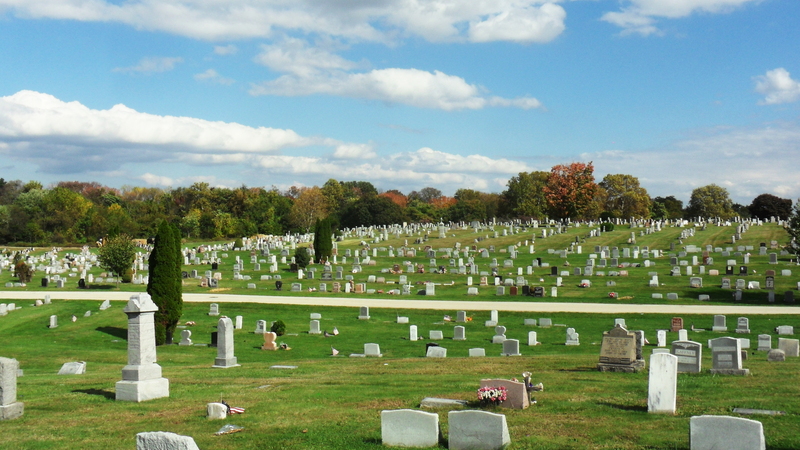 Also, stay tuned for Find-A-Grave Community Day, Part 2: Philadelphia National Cemetery. Great post, Tim! I agree with you, next time we should spend some time together at the end of the day, at least for coffee or something! I’m impressed that you found the cornerstone at your ancestor’s plot. I learned from Evie & Rich (who in turn learned from the cemetery staff) that fallen stones are buried to level the ground. This is a great post Tim! Thanks to you, Jenn and the other volunteers who participated in our first Find A Grave Community Day and great job on fulfilling so many of the photo requests! I expect this is the first of many events we will host as while anyone can take photos of a cemetery at any time, being able to help our community connect with one another, and even inspire new gravers, is something that we want to see happen, time and time again.